SAN DIEGO--(BUSINESS WIRE)--Jan. 29, 2018-- The word is finally out that cultural icons Jack Box, of the Jack in the Box ® restaurant chain, and Martha Stewart, lifestyle & culinary expert, are squaring off in the ultimate battle of the sandwiches. Judging from this leaked text message exchange between the two—things are really starting to heat up. Jack Box and his dedicated team have worked tirelessly to create the new Food Truck Series line— three deliciously appetizing sandwiches: Asian Fried Chicken Sandwich, Prime Rib Cheesesteak and Pork Belly BLT — launching system-wide on February 1. However, as this fight is just getting started, only time will tell if Martha gives Jack and his latest menu offering a chance. Fans are encouraged to follow along as this social media feud unfolds by checking out the hashtag #JackvsMartha following Sunday’s Big Game. 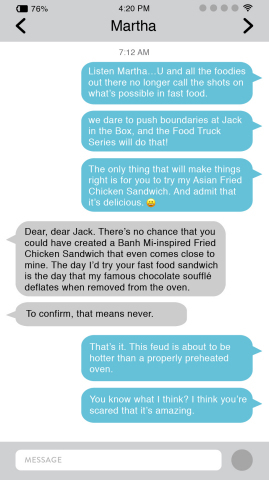 For more information, please visit jackinthebox.com, and connect with Jack on Facebook, Twitter, Instagram and YouTube. Martha Stewart is an Emmy Award-winning television show host, entrepreneur, bestselling author of 90 books, and America's most trusted lifestyle expert and teacher. Millions of people rely on Martha Stewart as a source of useful "how-to" information for all aspects of everyday living — cooking, entertaining, gardening, home renovating, collecting, organizing, crafting, holidays, healthy living and pets. The Martha Stewart brand reaches approximately 100 million consumers across all media and merchandising platforms each month. Her branded products can be found in over 70 million households and have a growing retail presence in thousands of locations.